Knee exercises can make your knees and other parts of lower limbs strong and healthy while also preventing further injuries. Exercises strengthen the muscles and stabilize the knees which further reduce the stress from knee joints. If the muscles supporting the front and back sides of thigh are strong, the risk of injuries or trauma due to sudden impact of force can be prevented. 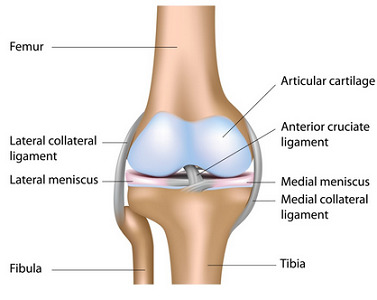 Lower pressure on knees also alleviates pain due to arthritis and other disease processes. Read on to learn how to perform the exercises to strengthen and stretch your knees. This exercise aims at supporting, stabilizing and strengthening the front part of thigh. Lie on the ground with one leg flexed at the knee joint; while strengthening other leg (as shown in the figure). Now tighten the muscles by stretching your straight leg while lifting it slowly at least one foot up from the ground level. Hold in that position for 3 – 5 seconds. Then slowly drop the leg back to the floor level and repeat the same procedure for the other leg. DO: keep the upper part of body relaxed but contract the muscles of stomach so that your lower back remains supported by the floor. DO NOT: avoid making the arch of your back while moving your leg in the jerking motion. This exercise is more focused at the back and front part of thigh, buttocks and hip. Take 2 chairs and have them on each side of your body while balancing the body. Now move your leg slightly at front. Put all your weight on other leg. Now slowly lower down yourself few inches and divert all your weight on the heel of the other leg (the limb supporting your weight). Hold in that position for 3 – 5 seconds then straighten back slowly. Repeat the exercise and then switch legs. Do: Recline like there is a chair at your back. 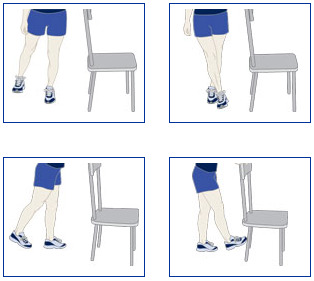 Do not: Allow the supporting leg’s knee to move forward above the level of the toes of your lower limb. This exercise is more focused for the posterior part of your thigh. Use the support from the back of chair for maintaining balance. 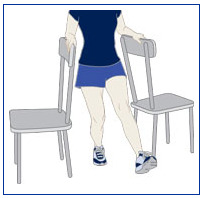 Now put all your weight on the supporting leg and lift you other foot in backward position so that the heel moves towards buttocks (as shown in the figure). Hold 3 – 5 seconds and then lower the leg slowly. Repeat the exercise and switch the legs. Do not: Avoid locking the supporting leg’s knee and do not lift your heel above angle of 90 degree. This exercise will be felt on every side of thigh, buttocks and hip. Use the back of chair for maintaining balance. Slowly lift one of your legs and put all the body weight on other leg. Now tighten the thigh muscles of lifted leg and slowly proceed towards the direction shown in picture. Hold 3- 5 seconds and then return to start position slowly. Repeat exercise then turn the body in 90 degree position and start next exercise as shown in picture. Do: focus the supporting leg as it is working as hard as the moving leg. Do not: Lock the supporting leg’s knee and do not make arch of your back while doing these exercises. 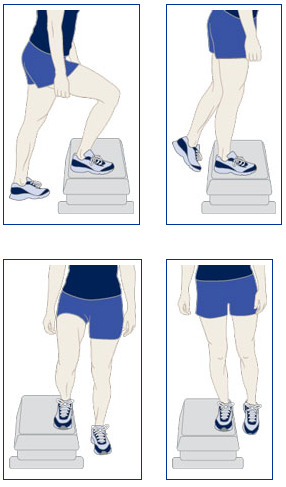 This exercise will be felt primarily along the front aspect of lower limb. Align your body along a wall in a position that your back, head, hips and back touches the wall. Now step your both foot 2 feet ahead of wall and hip’s width apart. Now slowly move along wall until you reach a sitting posture. Hold for 3 – 5 seconds and then slowly get back straight by sliding up. Repeat the exercise. Do: Keep the abdominal muscles tighten and try to hold position for longer when you get strength. Do not: Move the hips below knees and do not move forward knees above toes of lower limb. This exercise will be felt at the back and front part of thigh, buttocks and hip. Take a 6 inches high chair or any platform. Step your one foot over it and lift the other from the floor so that it hang without support. Hold 3 – 5 seconds then slowly put hanging foot on floor. Now place the stepping foot back on floor. Repeat exercise and switch legs. Do: Step your foot on stool properly so you may not fell down. Do not: Avoid locking the knees of foot that is hanging without support. 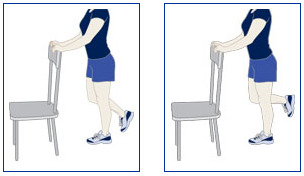 Use the chair’s back or wall for balancing the body. Now move one foot above the ground level and fold your leg so that the heel touches the buttocks. Grasp the ankle with hand and move the heel towards body. Hold in this position and stretch for at least 30- 60 seconds. Do: While stretching keep the knees closer. Do not: Avoid twisting your back or arching it. The stretch in this exercise will feel at thighs back and behind knees. Sit straight and extend both the legs in straight position. Let your feet neutral, not in flexed or pointed position. Put the palms of your hands on the floor and move them in sliding motion towards ankles. Hold 30 seconds in this position. Do: Keep you back long and chest open. When you start feeling stretch, stop sliding palms forward. Do not: Bring nose towards knees and avoid locking the knees. Your doctor will advise the appropriate exercise for your knees. Always start the exercise slowly as it takes time to strengthen the muscles. When you feel stronger then gradually increase you exercise time. Do not ignore any pain while doing exercise as any severe pain can cause injury. You may feel discomfort while doing exercise because you are stretching the muscles. If the exercises are giving any pains then stop doing it. After starting exercise, it is typical to feel stiff or little sore after a day. But if you feel so stiff that your body cannot move, it means you had overdone the exercise. Give your body rest for a day. Always ask your therapist or doctor about any pain, number of exercise to follow and how often to perform them.